Treatment of these fractures is governed by the vascularity (local tissue and distal), the condition of the soft tissues, and the presence or absence of compartment syndrome. Not all fractures of the tibial plateau require surgery. The first challenge in the management of upper tibial fractures is to decide between nonoperative and surgical treatment. In the past, long leg cast and traction mobilization were used for some fractures; however, the Sarmiento program of functional cast bracing is now preferred. Open or arthroscopic-assisted techniques are considered for fractures with displacement, depression of the condylar surfaces, or both. [15, 16, 17] Open surgical therapy can be immediate or staged. Combination devices may also be employed. The ultimate goals of tibial plateau fracture treatment are to reestablish joint stability, alignment, and articular congruity while preserving full range of motion (see the image below). In such a case, painless knee function may be achieved and posttraumatic arthritis prevented. If fracture displacement is great enough to produce joint instability, operative management should be selected. Current internal fixation techniques include ligamentotaxis, percutaneous fixation, and antiglide techniques. When extensive comminution and damaged soft tissues prohibit the use of internal fixation, circular external fixators are an excellent fallback option for management. Fixation of tibial plateau fractures must be rigid, and fracture stability should be maintained. If fixation implants are obviously loose or provide inadequate fixation, they should be removed. 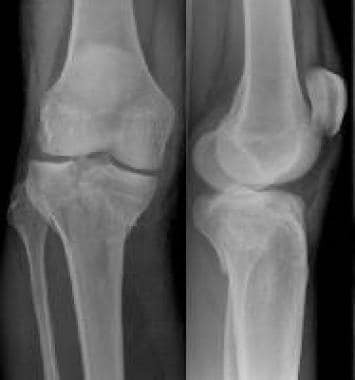 Intra-articular sepsis combined with fixation instability results in rapid chondrolysis and destruction of the joint. Preoperative magnetic resonance imaging (MRI) or arthroscopy is necessary to visualize the lateral meniscus and the fracture. When the fracture is displaced, the lateral meniscus commonly is detached peripherally and not infrequently is trapped within the fracture site. If a peripheral tear is present, with or without incarceration of the meniscus in the fracture site, open reduction with internal fixation (ORIF) is recommended with meniscal repair. If the meniscus is intact, closed reduction and percutaneous cannulated cancellous screw fixation is preferred. The quality of the reduction is assessed arthroscopically or with an image intensifier. If satisfactory reduction is not possible by closed means, open reduction is used. 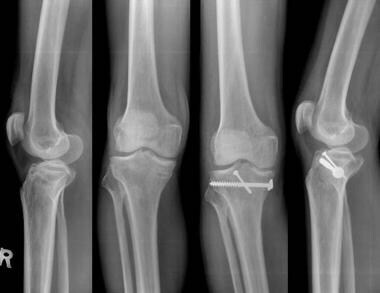 With joint instability, surgery should be used to address the impacted articular fragments (see the images below). In these fractures, the depressed fragment must be elevated and supplemented with a bone graft. This can be performed either intra-articularly, elevating the anterior horn of the lateral meniscus, or by making a window in the lateral condyle and elevating the fragment with support from graft material and fixation with a buttress plate. Type II tibial condyle fracture involving the tibial spine and more than 50% of the medial condyle fixed with biological buttress plating of the lateral plateau. If depression is anterior or central, a straight lateral parapatellar skin incision with transverse submeniscal joint exposure is better. Preservation and repair of the lateral meniscus is the goal. With the use of an impactor from below, the fracture fragments are disimpacted, elevated, and supported with a bone graft. In the case of minimal comminution of the lateral condyle, cancellous screws with washers suffice, whereas a buttress plate is advocated for a comminuted fracture in soft osteoporotic bone. If the depression is small and the joint remains stable, nonoperative treatment is preferred in elderly persons. However, if the joint is unstable in a physiologically younger patient, surgery is usually indicated. The depressed fracture can be visualized with arthroscopy or under a C-arm. A window is made in the metaphyseal region, the depressed articular surface is elevated, and the subarticular portion is supported with a graft and then supported with one or two cannulated screws or with a plate (see the image below). Formal open reduction and plate fixation for Schatzker type I-III fractures is an alternative to arthroscopically assisted reduction and fixation. Direct visualization of the reduction of the joint surface can be obtained via a submeniscal arthrotomy or by detaching the anterior horn of the lateral meniscus using a lateral approach. In cases with wide displacement, associated fibular head fracture, and osteoporotic bone, buttressing with a plate provides better fixation than screws alone and may decrease the risk of collapse of the elevated fragments. If one is in doubt, buttressing should be used. Type IV medial tibial condyle fracture treated with arthroscopy-assisted elevation and percutaneous cancellous screw fixation along with percutaneous screw fixation of the tibial spine fracture. Nonoperative treatment is indicated only for nondisplaced fractures. Patients with good bone stock who have sustained low-energy trauma are better treated by closed reduction and percutaneous cannulated cancellous screw fixation. In those with high-energy fractures with tearing of the lateral collateral ligament or fracture of the fibular head, a midline or medial parapatellar approach and extraperiosteal approach is preferred. The fracture must be elevated, reduced, and supported by a buttress plate, and the soft tissues should be repaired. If the intercondylar eminence with the cruciate is avulsed, it should be reduced and fixed with a lag screw or loop of wire. In patients with a predominant posterior fragment, an additional posteromedial incision may be necessary. Type V and VI tibial plateau fractures (see the images below) are usually due to high-energy forces and are often associated with compromise of the surrounding soft tissues. 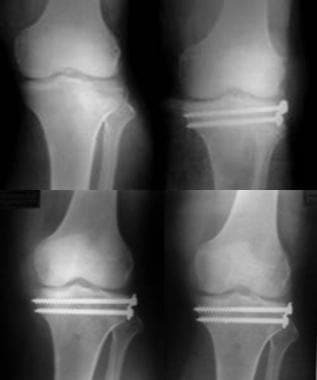 In these cases, extensible exposure of the upper tibia with subperiosteal placement of large implants should be avoided. This approach has been associated with an increased risk of wound dehiscence and infection. 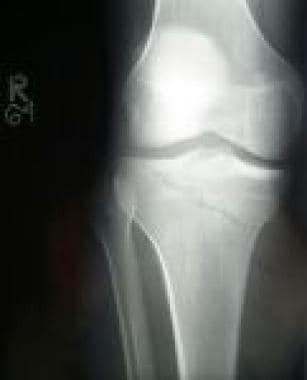 Shown is a Schatzker type V fracture, with a displaced and depressed medial tibial plateau. Type VI tibial plateau fracture undergoing biological fixation of the lateral condyle and external fixation of the medial plateau, resulting in an acceptable clinical and radiological result. Type VI tibial plateau fracture with severe soft tissue injury successfully treated with Ilizarov external ring fixator. High-energy type VI tibial plateau fracture treated with bone grafting and double plating after the soft tissue condition improved. Fractures involving both condyles routinely require repair. The plateau with the most severely involved articular surface should be plated first. The less involved side should be treated with minimal, biologic fixation using percutaneous implants, limited posteromedial incisions, or a small external fixator to minimize exposure and bone stripping. They are frequently comminuted, and the shaft may be dissociated with the metaphysis. 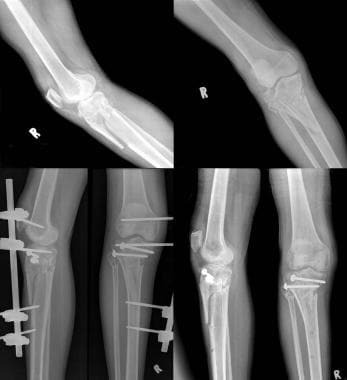 Many of these fractures, portrayed in the images below, are better treated with external fixation. Because of the potential disability associated with chronic flexion contracture, after surgery, these patients should be placed in a hinged knee brace that is locked in extension. A padded bump under the heel is used both in the hospital bed and at home after discharge to maximize knee extension. Nonweightbearing precautions generally continue for 12 weeks. Active flexion and passive extension are encouraged for 6 weeks, after which period active knee extension is started. Active knee extension is delayed if ORIF of a tibial tubercle avulsion was required. Agnew SG. Tibial plateau fractures. Oper Tech Orthoped. 1999. 9(3):197-205. Burrows HJ. Fractures of the lateral condyle of the tibia. J Bone Joint Surg Br. 1956 Aug. 38-B(3):612-3. [Medline]. Rasmussen PS. Tibial condylar fractures. 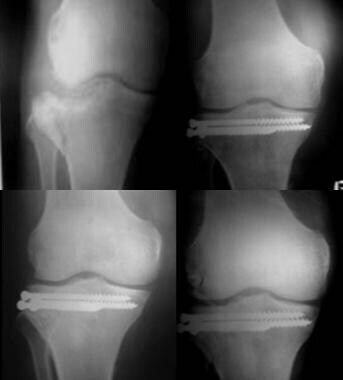 Impairment of knee joint stability as an indication for surgical treatment. J Bone Joint Surg Am. 1973 Oct. 55(7):1331-50. [Medline]. Sarmiento A. Functional bracing of tibial and femoral shaft fractures. Clin Orthop Relat Res. 1972 Jan-Feb. 82:2-13. [Medline]. Maripuri SN, Rao P, Manoj-Thomas A, Mohanty K. The classification systems for tibial plateau fractures: how reliable are they?. Injury. 2008 Oct. 39(10):1216-21. [Medline]. Hohl M, Luck JV. 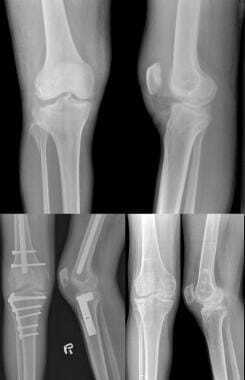 Fractures of the tibial condyle; a clinical and experimental study. J Bone Joint Surg Am. 1956 Oct. 38-A(5):1001-18. [Medline]. Hohl M. Tibial condylar fractures. J Bone Joint Surg Am. 1967 Oct. 49(7):1455-67. [Medline]. Moore TM. Fracture--dislocation of the knee. Clin Orthop Relat Res. 1981 May. (156):128-40. [Medline]. Schatzker J, McBroom R, Bruce D. The tibial plateau fracture. The Toronto experience 1968--1975. Clin Orthop Relat Res. 1979 Jan-Feb. (138):94-104. [Medline]. Weaver MJ, Harris MB, Strom AC, Smith RM, Lhowe D, Zurakowski D, et al. Fracture pattern and fixation type related to loss of reduction in bicondylar tibial plateau fractures. Injury. 2012 Jun. 43 (6):864-9. [Medline]. Dennan S. Difficulties in the radiological diagnosis and evaluation of tibial plateau fractures. Radiography. 2004. 10:151-8. Mustonen AO, Koivikko MP, Lindahl J, Koskinen SK. MRI of acute meniscal injury associated with tibial plateau fractures: prevalence, type, and location. AJR Am J Roentgenol. 2008 Oct. 191(4):1002-9. [Medline]. Laible C, Earl-Royal E, Davidovitch R, Walsh M, Egol KA. Infection after spanning external fixation for high-energy tibial plateau fractures: is pin site-plate overlap a problem?. J Orthop Trauma. 2012 Feb. 26(2):92-7. [Medline]. Pernaa K, Koski I, Mattila K, Gullichsen E, Heikkila J, Aho A, et al. Bioactive Glass S53P4 and Autograft Bone in Treatment of Depressed Tibial Plateau Fractures - A Prospective Randomized 11-year Follow-Up. J Long Term Eff Med Implants. 2011. 21(2):139-48. [Medline]. Lubowitz JH, Elson WS, Guttmann D. Part I: Arthroscopic management of tibial plateau fractures. Arthroscopy. 2004 Dec. 20(10):1063-70. [Medline]. Lubowitz JH, Elson WS, Guttmann D. Part II: arthroscopic treatment of tibial plateau fractures: intercondylar eminence avulsion fractures. Arthroscopy. 2005 Jan. 21(1):86-92. [Medline]. Chen XZ, Liu CG, Chen Y, Wang LQ, Zhu QZ, Lin P. Arthroscopy-assisted surgery for tibial plateau fractures. Arthroscopy. 2015 Jan. 31 (1):143-53. [Medline]. 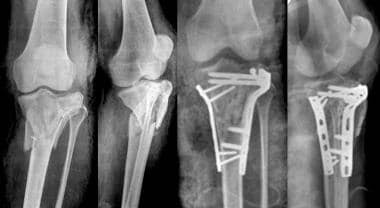 Kayali C, Oztürk H, Altay T, Reisoglu A, Agus H. Arthroscopically assisted percutaneous osteosynthesis of lateral tibial plateau fractures. Can J Surg. 2008 Oct. 51(5):378-82. [Medline]. Kumar P, Singh GK, Bajracharya S. Treatment of grade IIIB opens tibial fracture by ilizarov hybrid external fixator. Kathmandu Univ Med J (KUMJ). 2007 Apr-Jun. 5(2):177-80. [Medline]. Craiovan BS, Keshmiri A, Springorum R, Grifka J, Renkawitz T. [Minimally invasive treatment of depression fractures of the tibial plateau using balloon repositioning and tibioplasty : Video article]. Orthopade. 2014 Oct. 43(10):930-3. [Medline]. Yoon RS, Liporace FA, Egol KA. Definitive fixation of tibial plateau fractures. Orthop Clin North Am. 2015 Jul. 46 (3):363-75, x. [Medline]. Krappinger D, Struve P, Smekal V, Huber B. Severely comminuted bicondylar tibial plateau fractures in geriatric patients: a report of 2 cases treated with open reduction and postoperative external fixation. J Orthop Trauma. 2008 Oct. 22(9):652-7. [Medline]. Yu B, Han K, Ma H, Zhang C, Su J, Zhao J, et al. Treatment of tibial plateau fractures with high strength injectable calcium sulphate. Int Orthop. 2009 Aug. 33 (4):1127-33. [Medline]. Lasanianos N, Mouzopoulos G, Garnavos C. The use of freeze-dried cancelous allograft in the management of impacted tibial plateau fractures. Injury. 2008 Oct. 39(10):1106-12. [Medline]. Russell TA, Leighton RK. Comparison of autogenous bone graft and endothermic calcium phosphate cement for defect augmentation in tibial plateau fractures. A multicenter, prospective, randomized study. J Bone Joint Surg Am. 2008 Oct. 90(10):2057-61. [Medline]. Duan XJ, Yang L, Guo L, Chen GX, Dai G. Arthroscopically assisted treatment for Schatzker type I-V tibial plateau fractures. Chin J Traumatol. 2008 Oct. 11(5):288-92. [Medline]. Mills WJ, Barei DP. High-energy tibial plateau fractures: Staged management. Oper Tech Orthoped. 2003. 13(2):96-103. Chan YS, Chiu CH, Lo YP, Chen AC, Hsu KY, Wang CJ, et al. Arthroscopy-assisted surgery for tibial plateau fractures: 2- to 10-year follow-up results. Arthroscopy. 2008 Jul. 24(7):760-8. [Medline]. Rossi R, Bonasia DE, Blonna D, Assom M, Castoldi F. Prospective follow-up of a simple arthroscopic-assisted technique for lateral tibial plateau fractures: results at 5 years. Knee. 2008 Oct. 15(5):378-83. [Medline]. Papagelopoulos PJ, Partsinevelos AA, Themistocleous GS, et al. Complications after tibia plateau fracture surgery. Injury. 2006 Jun. 37(6):475-84. [Medline]. Mehin R, O'Brien P, Broekhuyse H, Blachut P, Guy P. Endstage arthritis following tibia plateau fractures: average 10-year follow up. Can J Surg. 2012 Feb 1. 55(1):003111-3111. [Medline]. Garner MR, Thacher RR, Ni A, Berkes MB, Lorich DG. Elective removal of implants after open reduction and internal fixation of Tibial Plateau fractures improves clinical outcomes. Arch Orthop Trauma Surg. 2015 Nov. 135 (11):1491-6. [Medline].